Last summer, Barack Obama and leaders of the European Union announced that negotiations would commence on another trade deal, the Transatlantic Trade and Investment Partnership (TTIP), a treaty that’s gotten significantly less attention than the TPP. Also known as the Transatlantic Free Trade Area (TAFTA), it would harmonize trade rules between the US and the EU, which constitutes the world’s largest economy. While negotiations on the deal started last July, proposals for creating a giant transatlantic trading bloc date back to the early 1990s. Wondering what all of these deals are about? Here’s a primer on the Obama administration’s vision for global trade. But there’s reason to be skeptical that a deal is possible. A complex treaty is impossible to negotiate without Congress giving the president “fast-track” trade authority. Fast-track strips Congress’s ability to amend any agreement the president makes with other countries — they would only be able to vote yea or nay. Isn’t free trade a good thing? The phrase “free trade” is a euphemism favored by advocates of trade deals like the TPP. In practice, countries seek to liberalize trade in areas where they hold a competitive advantage, and enact trade barriers in areas where they don’t. For example, the US and other highly developed nations want to strengthen patent protections and intellectual property rights while liberalizing trade in goods and services. These disputes are the primary reason that for over a decade the global trade movement has been stalled at the World Trade Organization. That’s why “free trade” advocates have shifted their focus to smaller, regional trade blocs in the hope of finding consensus. And while there is evidence that increasing trade boosts corporate profits and the incomes of those well positioned in the global economy, it also accounts for net job losses and increasing economic inequality in highly developed economies. But its impact on the distribution of income was anything but tiny. Rosnick wrote that the incomes of those at the very bottom of the ladder would be protected by the minimum wage, and those at the very top would benefit significantly from the deal’s intellectual property and investment protections. But the vast majority of Americans would see their incomes drop. This graphic is based on four different academic estimates of how much trade policy has contributed to rising income inequality — from a low of 10 percent to a high of 50 percent. A comprehensive study by Public Citizen of the impact of the North American Free Trade Agreement (NAFTA) on its 20th anniversary found that Rosnick’s projections are very much in line with past historical experience. I haven’t got all day — what’s the key issue with these deals? Broadly speaking, they transfer power from governments — including democratically elected governments — to corporations. And while all treaties require governments to give up some measure of sovereignty, only trade agreements are binding, and have established enforcement mechanisms. ISDS was first proposed in the WTO in Singapore in the mid-1990s, and it has been a sticking point in that forum ever since. Its inclusion also contributed to the collapse of talks over the proposed Free Trade Area of the Americas (FTAA) in 2005. That sounds bad — why are democratic governments pushing this stuff? While advocates claim these deals create a rising tide that lifts all boats, the reality is that they primarily benefit those who can afford to hire lobbyists to advance their own narrow interests. Then, when a treaty is hammered out, the pressure on lawmakers to ratify it is intense. In his book, The Myths of Free Trade, Sen. Sherrod Brown (D-Ohio), writes that the airspace over Washington, DC, was clogged with corporate jets ferrying in executives to lean on Congress on the eve of the vote for the CAFTA-DR agreement. The treaty at first appeared to be headed for defeat, but Republicans kept the vote open and kept whipping votes until after midnight, when it squeaked through with a two-vote margin. Many debates about this issue are based on trade theory. But the process is so skewed in favor of corporate profits over workers, the environment or public interest regulations that a win-win deal is impossible. If these TPP and TIPP treaties are so secretive, how can we say what’s in them? Several drafts of TPP have been leaked, most recently an August 2013 draft released by Wikileaks. We also know that the TPP was launched after the collapse of the FTAA negotiations, with a group of countries that were believed to be more amenable to the controversial investment rules that helped bring that process to a halt. A February 2013 draft of TIPP’s crucial chapter on “trade in services, investment and e-commerce” was also leaked to the German newspaper Die Zeit this spring. What’s more, there are already very few trade barriers between the US and EU — the low-hanging fruit has already been liberalized, and what remains are the most controversial areas. Are there differences between these treaties that we should understand? TPP is what’s known as a North-South agreement between wealthy and poor countries. TIPP, on the other hand, will be negotiated by entities with relatively equal economic and political power. The power differential inherent in negotiations between rich and poor countries is problematic. If Guatemala were to protect one of its industries from competition with US firms, the impact on the American economy would be negligible, but access to a market like the US can confer huge benefits to a country like Guatemala. They also dominate the negotiating process itself, with poorer countries often struggling to get draft agreements translated and analyzed in a timely manner. In their seminal book, Behind the Scenes of the WTO: The Real World of International Trade Negotiations, Fatoumata Jawara and Aileen Kwa explained in ugly detail what kinds of arm-twisting and hardball politics go on behind the closed doors of international trade negotiations as wealthy countries work to get the poorest nations to bend to their will. These tactics should be expected during negotiations for the TPP, where the US, Canada and Japan are likely to dominate countries like Vietnam, Brunei and Peru. TIPP, on the other hand, is being negotiated between two of the world’s largest economies, so the playing field will be pretty equal. And TPP simply covers more issues than TIPP — it’s a broader treaty — which means more activists concerned with specific issues will find various provisions to be problematic. OK, thanks for the backgrounder, but how can I satisfy my need for lots of detail? No organization has done more extensive analysis of these and other trade treaties than Public Citizen’s Global Trade Watch. Check out their TPP and TIPP/TAFTA pages. Also check out their report on NAFTA’s legacy at age 20, and our interview with Global Trade Watch Director Lori Wallach. 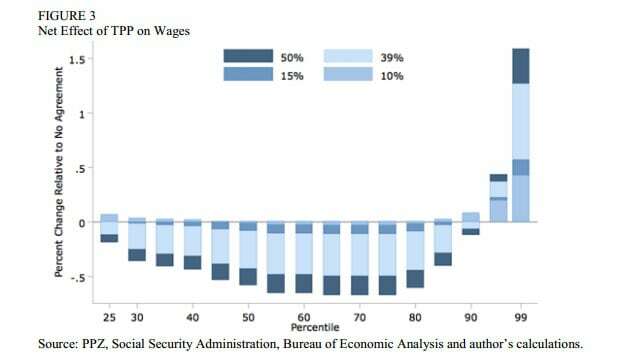 You can download David Rosnick’s study of TPP’s likely impact on wages at CEPR.net. National Geographic surveyed several environmental groups to get an idea of what concerns them about the leaked drafts of the TPP. The Electronic Frontier Foundation has a brief on how TPP might impact your Internet usage and ability to download stuff from the Internet. And for a good example of the hypocrisy of those who claim to have an abstract love of “free trade,” check out my 2005 piece, “Seafood Fight!,” about a small trade war over catfish and shrimp between the US and Vietnam.